Making your own Easter egg is fun and rewarding, and the decoration it is the best bit. You can go as simple or intricate as you like and even get the kids involved. Homemade Easter eggs are a great personalised edible gift and will be appreciated by friends and family. 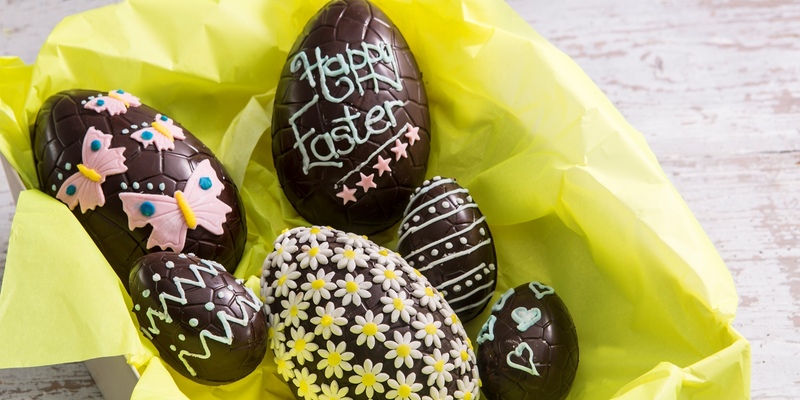 Melt white chocolate and use it to create patterns on your egg – zig zags, swirls and dots all work well, or try writing a loved one’s name or a message. For an even easier decoration, stick white chocolate buttons onto your eggs. Try adding sugar paste flowers to Easter eggs for a professional look. Arrange them all over or just on one section of the egg. You can also use writing icing to pipe colourful patterns. Icing stamps can be used to create shapes such as butterflies, stars and hearts. Once you have decorated your egg be sure to make the final presentation just as special. Try wrapping it in cellophane with shredded green crepe paper and tying with a ribbon, or stuff a box with yellow tissue paper and gently place the egg inside.